When in Bali in 1984, I was walking home one night sometime past midnight. 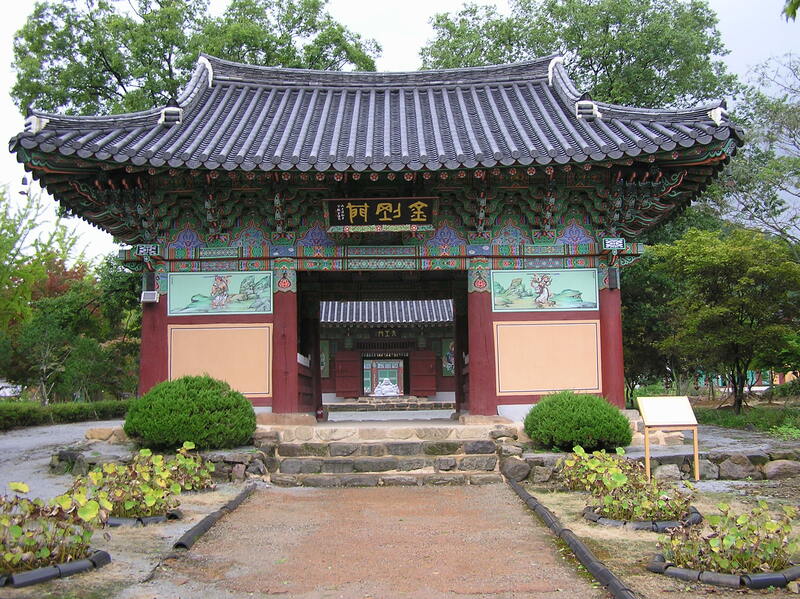 In the distant I heard a deep percussive sound that led me behind a few buildings to a covered performance area. It was a full performance of Jegog Bumbung, a dance drama where a cocky young man chased a single woman dancer. She coyly flirted with him until he caught her and then submitted to his charms. After an intermission there was a scream and the man flew out behind the screen in fear chased by his newly married wife who is now obviously in the dominant role. 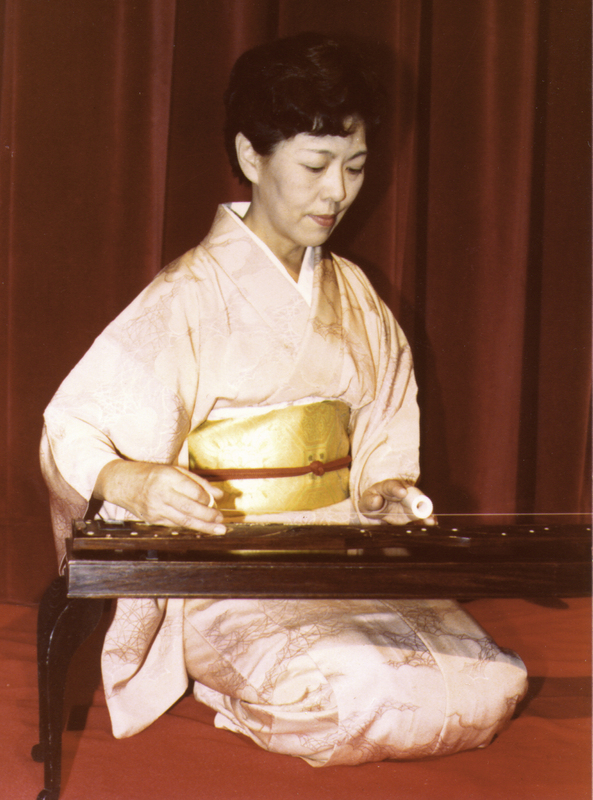 The music was performed by an orchestra of struck bamboo tubes open on one end with a large tongues carved on one side, suspended in frames. The largest of these instruments had pipes at least three metres long. They were accompanied by a number of sets of progressively smaller instruments playing the characteristic Balinese interlocking rhythms. This ensemble of instruments is called Gamelan Grantang. The sound of the big instruments was very round and deep and traveled well in the night air. This performance went on for hours and although I was the only non-Balinese there I sat listening and watching to almost dawn. A few weeks later, I ran into another version of a bamboo gamelan in a small village close to where I had found a small cabin to rent on the beach (see Bali Night). 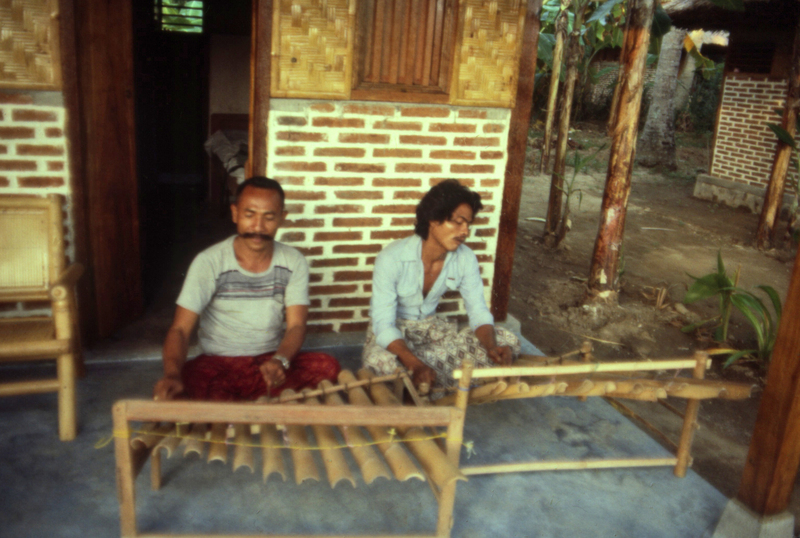 One morning I again followed music in the air and came upon two men sitting on their porch playing a matched pair of bamboo instruments called tingklik, which looked identical to the smallest of the instruments played in the Gamelan Grantang. Although they played very fast interlocking parts, they didn’t seem to tire as they played for almost an hour. The older man invited me to sit down, served me tea and they continued to play. After playing for a while, he asked me if I would like to try the instrument, and handed me the mallets. 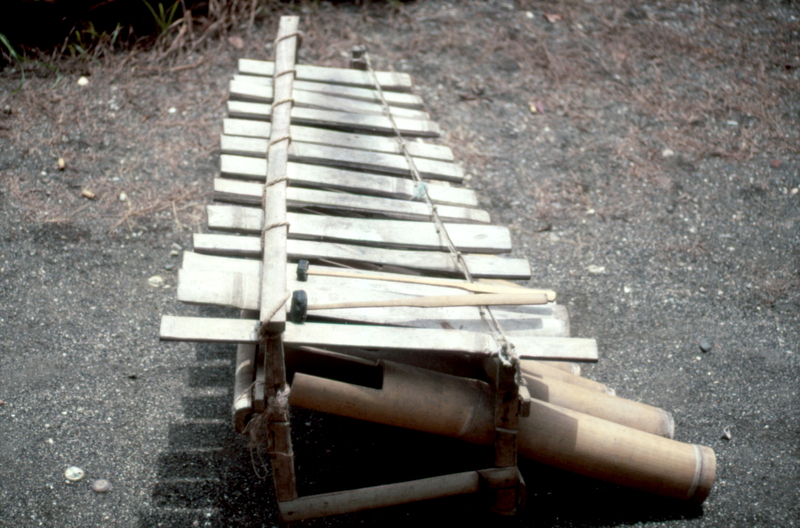 Although the tingklik is about a dozen hollow tuned bamboo tubes suspended from a small frame the technique for playing it is quite complex. The left hand plays a rather simple melody on the lower tubes, while the right hand plays the rapid intricate patterns following the melody while interlocking with the second instrument. On just hearing the piece, I was only able to remember a few notes on the right hand before making a mistake at which point my impromptu teacher, took the mallets from my hand and played the piece again, all fifteen minutes of it! He then calmly handed the mallets back to me and asked me to try again. I only managed to play a few more notes correctly before running into problems, and again the mallets were politely taken from my hands, and the full fifteen-minute piece was played again. This process continued well into the afternoon, with my teacher patiently playing the full piece again and again as I muddled my way through it. Our modern world doesn’t allow us to have the time or patience for this type of musical transmission, and I didn’t have the time to stay and study this amazing instrument, although I really wanted to. I imagine that growing up from birth hearing these sounds would implant the music far deeper in your psyche than any other form of learning. Maybe I was born in the wrong time. A month after my impromptu lesson, I traveled to a small village in northern Bali to discover a single bamboo xylophone that was quite different in shape than any other that I had seen on the island. 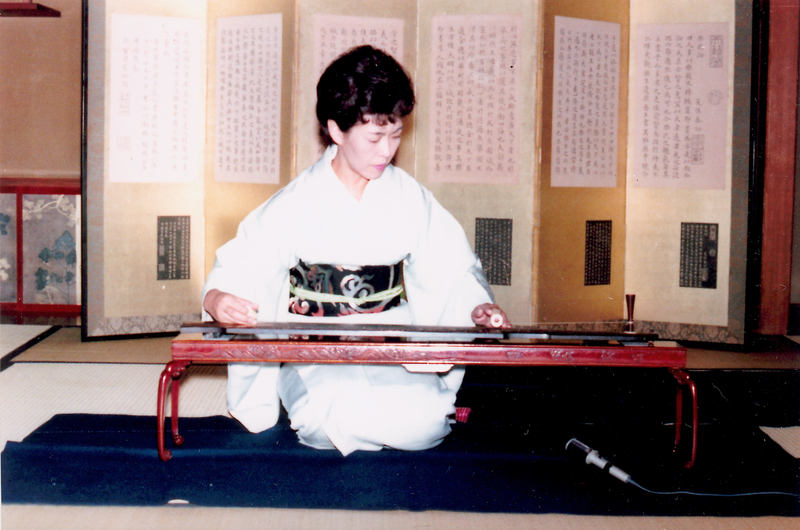 It had bamboo slats of different sizes for keys and bamboo tube resonators. I asked some local people where the instrument was from. “From here,” they replied, “it’s native to our village.” “Do you know anybody who can play it?” I asked. “There is no-one left who knows how to play it,” they replied, “the last person died a year ago.” “Are there any recordings or books on how to play it?” I asked. “No,” was the reply, “nothing at all. The music is lost.” Hearing this was a shock and it deeply saddened me. Since then I have given a good portion of my life to support and preserve traditional instruments and music wherever I could.